Exquisite, intricate, vibrant and shimmering are just some of the descriptions that one uses to describe the rich abundance of Kutchi craftwork, in particular its textiles. But it's not just the sight and feel of the textiles that makes Kutch such a special destination; it is the experience of observing traditional artisans - including National Award Winners - at work in their homes and villages as they have done for generations, and even having a go yourself. Textiles are - quite literally - the fabric of Kutchi culture - a basic unit of identity, associated with dowry rituals, social hierarchy and festivals. The inter-dependence between farmers and herders with dyers and weavers, as well as potters and leather-workers, traces back to the Indus Valley civilisation, some 5000 years ago. Today, the work of various NGO groups has allowed this ancient culture to find new relevance and immense pride in the modern world. Both cotton and wool are hand-spun, dyed and woven on pit-looms, to create earthy but sophisticated scarves, shawls, blankets and carpets. Products are often subtly embellished with touches of hand-embroidery or mirror-work. The most famous weaving community is located at the village of Bhujodi, a few kilometers outside of Bhuj, but you'll find weaving families throughout the region. The ancient Ajrakh craft involves printing intricately carved wood-blocks on to fabric, using dyes traditionally made from natural sources, such as pomegranate, indigo and iron. Floral and geometric motifs are typically used, but artisans are increasingly exploring contemporary patterns and designs. Ajrakhpur, 12kms from Bhuj is the main hub where you can see this ancient artform in production. 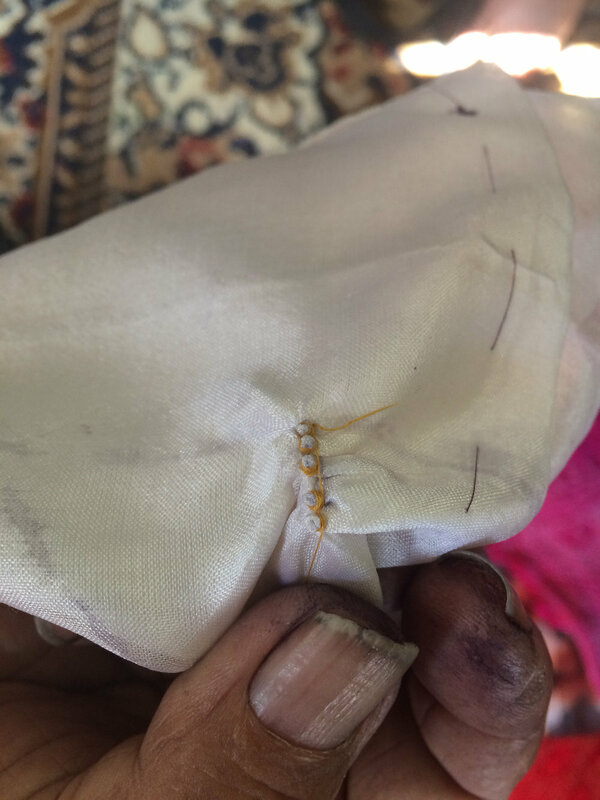 Literally translated as 'to tie', Bandhni is a technique whereby tiny pinches of a fabric are tightly bound in fine thread to resist the dye. After dying, the thread is unravelled to reveal a mesmerising dotted pattern. 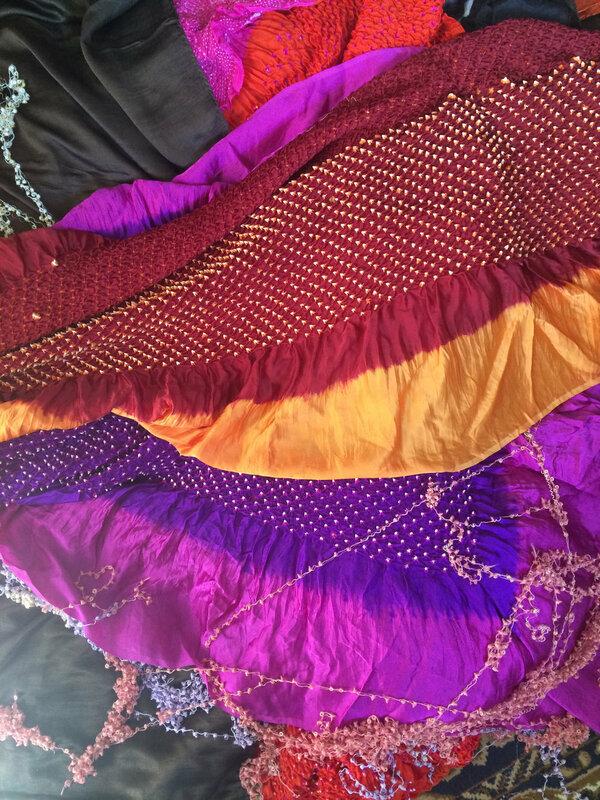 Bandhni sarees and salwar sets are abundant in Bhuj's main bazaar, while a number of artisans are experimenting with shibori and clamping while refining their techniques. Kutchi embroidery is some of the finest that India produces. Intricate stitches, often incorporating small mirrors are typical of most styles, although each style is uniquely representative of different tribal communities: Rabari, Ahir, Mutwa and Jat are examples. Sumrasar and Dhordo are famous embroidery villages, but embroidery is found all over Kutch. Quilted blankets - patchworked together using old, colourful pieces of material - are one of the ways how the Kutchi people kept themselves warm during winter in the desert. You can find examples of patchwork and applique in villages around the Banni, just south of the Great Rann. Patchwork is often undertaken by senior ladies, when the dexterity and eye-sight required for fine embroidery becomes challenged. Batik is one of Kutch's smaller textile crafts, confined mostly to a number of families around Mundra on the south coast. Like ajrakh, batik involves the use of printing with carved wooden blocks. Wax is applied on to the block and pressed on to the fabric which resists the dye, except for fine threads of dye which seep through the cracks and give batik its signature 'veined' appearance. After dying, wax is removed with boiling water and collected for re-use.